Every author has her favorite tools to help her produce words on the page. 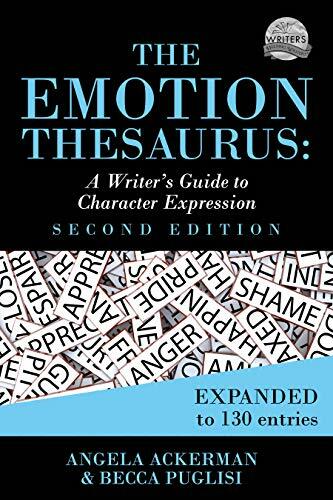 One of my favorites is The Emotion Thesaurus: A Writer’s Guide to Character Expression by Angela Ackerman and Becca Puglisi. I turn to this book often to help me show what my character is feeling. A novelist could put down the sentence Jane is happy, but those words just lie there flat. There is no emotion to them that can connect the reader to Jane’s happiness. It almost sounds like a factual statement like there are 50 states in the United States. There is no emotional resonance to that fact. A point of view character is the emotional gateway for a reader to experience the story. No gateway means no connection with the reader. The romance genre is especially all about the emotions. Amazing as The Emotion Thesaurus is, there is even more good news. On February 19, 2019,the second updated edition is being released. This includes an additional 55 more emotional descriptions, bringing the total to 130. Human beings have a wide range of emotions! Thanks so much for taking the time to share your experience with The Emotion Thesaurus. Louise! Becca and I am so glad this guide is helping you create that powerful emotional connection between the character and the reader!